In late March, Thailand held its first general elections since 2014. While official results are not expected until May, preliminary results point toward a coalition government led by the pro-military Palang Pracharat Party (PPRP). General Prayuth is also likely to continue as prime minister. The PPRP party has signaled its commitment to economic stability and could implement populist policies, including higher welfare expenditure and increasing the minimum wage. While potentially boosting consumption, these policies may also risk wage cost inflation. We believe policy continuity may lead to an acceleration in reforms, including infrastructure development. This, in turn, could further support the domestic economy. Thai equities may also see an increase in portfolio inflows, following a change in the MSCI foreign ownership criteria. In the lead up to Indian general elections next quarter, we could see increased volatility. However, we believe India’s growth path, underpinned by policies put in place since 2014 by Prime Minister Narendra Modi, is well-enough established to withstand any short-term challenges. These policies have helped India become the fastest-growing major emerging-market (EM) economy in 2018, at 7.3% gross domestic product (GDP) growth.1 Even if there was a surprise election result, we believe the impact from uncertainty would be felt in the short term, because fundamentals remain intact. Taking a longer-term view, India continues to benefit from secular growth drivers such as favorable demographics, infrastructure investment, urban consumption growth and increasing income levels. The US Federal Reserve (Fed) confirmed its dovish stance at its March meeting, signaling no additional rate hikes for the year, and one increase in 2020. The Fed also committed to ending its balance sheet taper by September. The pause in rate hikes saw some risk appetite return to EMs, contributing to the rally in the first quarter. While Fed expectations for US GDP growth for the year have weakened, EMs are still expected to achieve faster economic growth than developed markets (DMs) in 2019 and for the foreseeable future. 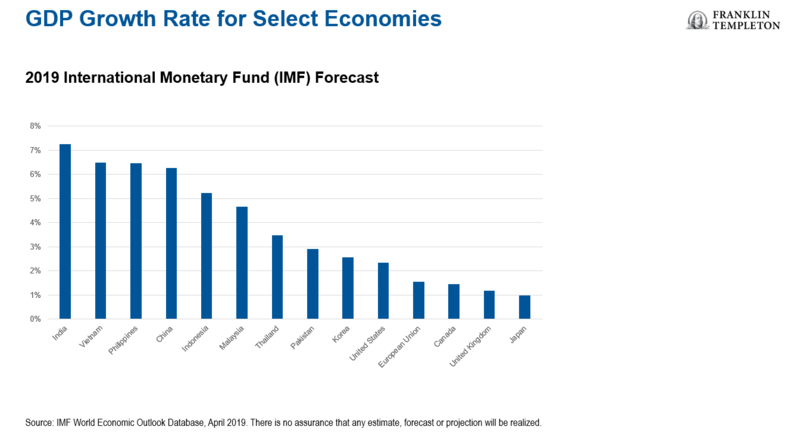 The International Monetary Fund (IMF) forecasts EMs to grow 4.5% in 2019, more than double the 2.0% estimate for DMs.2 We remain optimistic for the prospects of EMs, particularly at current valuations. Solid economic growth, increased risk appetite and the availability of attractive investment opportunities in EMs have been key drivers of recent fund flows into the asset class. Supported by indications that the US Federal Reserve will no longer raise interest rates in 2019, this trend could continue. EM valuations also remain lower when compared to their DM counterparts. A key risk, however, remains the US-China trade negotiations, which could weigh on investor confidence should talks falter. For us, Asia remains a key area of interest. Improving corporate governance in South Korea, technology leadership in Taiwan, premiumization in China, and increasing penetration in India are several of the key trends we are witnessing in the region. The opportunity set of listed companies in Asia is large, with countries at varied stages of development. However, at the same time, idiosyncratic considerations aside, there are country-specific risks that investors need to be aware of. Currency, political events, economic policies and regulations are some of the broader risks that many of the Asian countries face. We believe EMs should be a staple investment for global investors given the large and wide investment opportunity it offers. Some of the most compelling reasons for considering EM equities remain the growing consumer market, technological advances and attractive valuations. Asian equities led regional performance across EMs. Gains in Asia were broad-based, with China, Taiwan and Pakistan recording the strongest returns. Hopes for a US-China trade deal provided a major boost for equities in China and export-oriented markets such as Taiwan. Though China lowered its GDP growth target for 2019, investors welcomed Beijing’s pledges to introduce more stimulus measures to support the economy. Colombia and Peru led performances in Latin America, with both markets ending the quarter with double-digit gains. Despite recording positive returns, Brazil and Mexico, lagged their EM and regional peers. Healthy macroeconomic data, including strong 2018 GDP growth data and improving trade numbers, supported investor confidence in Peru. Slow progress on social security reform and disappointing 2018 GDP growth data held back the Brazilian market. International ratings agency Standard & Poor’s lowered Mexico’s sovereign outlook to negative from stable on concerns about growth and the government’s energy policy. As a group, emerging European markets lagged their EM counterparts. Russia and Greece, however, bucked the trend with strong returns. Turkish and Polish equities declined, while Hungary and the Czech Republic recorded relatively smaller gains. Higher oil prices and appreciation in the Russian ruble boosted investor sentiment in that market. Although higher metal prices drove returns in steel and platinum companies in South Africa, the central bank’s 2019 economic growth forecast downgrade curbed optimism. Frontier markets ended the month with gains, but fared worse than their global counterparts. Kenya, Kuwait and Vietnam led returns, while Argentina and Nigeria underperformed. Increased expectations of an upgrade to EM status by MSCI drove stock prices in Kuwait. In Kenya, shares in the banking sector rose following a court ruling annulling a banking law that capped lending interest rates. Depreciation in the Argentine peso and concerns about austerity measures impacted investor confidence in that market. CN China 0 The negative outlook is mainly driven by the uncertainties surrounding the US-China trade dispute. As the US cycle matures and global growth momentum slows, the IMF forecasts China’s GDP growth to ease to just over 6.0% in 2019. While the trade dispute and Huawei incident could lead to weaker exports, government stimulus and tax cuts are expected to support domestic consumption and fixed asset investment. IN India 0.5 Long-term fundamentals, including under-penetration, formalization of economy and a stable government remain intact. However, the improving current account deficit and easing inflationary pressure and a strong possibility of an improvement in corporate earnings are offset by higher-than-average valuations and incremental political uncertainty. ID Indonesia 0.5 Economic growth remains steady. However, politics will likely heat up ahead of the legislative and presidential elections in April 2019. KR South Korea 0.5 Macro indicators remain sound. However, concerns about government regulations are growing, while the geopolitical situation warrants close attention. PK Pakistan 0 Uncertainty remains with concerns on a political reshuffle and high current-account deficit. TW Taiwan 0.5 Inflation has been manageable, limiting pressure on interest rates. While ongoing trade talks between the US and China have supported near-term sentiment, fundamentals remain weak and could take time to recover. Weaker-than-expected IT demand is also worrying, leading related companies to face more headwind. TH Thailand 0.5 Economic stability remains strong, but the growth outlook is moderate. Near-term volatility and political noise, however, could be seen since official election results are not expected until May 9. VN Vietnam 0.5 IMF estimates GDP growth at 6.5% in 2019, underpinned by resilient domestic demand and strong export-oriented manufacturing. Risks include a slowdown in exports and investment. CZ Czech Republic 0.5 The recent business survey data showed a certain degree of softening with economic sentiment declining in February, compared to a year earlier. Manufacturing confidence trailed downward, reaching its lowest value since 2014, which may lead to decreasing exports and lower economic growth. HU Hungary 0 Although consumer confidence has been negative in recent months, it has been improving. Overall, economic sentiment remains relatively flat at high levels. Economic performance is expected to remain solid, but the tight labor market has led to persistent issues, including: business pricing strategies, unit costs and rising inflation. RU Russia 0.5 In a stable oil price/ruble environment, domestic names should benefit due to earnings revisions and improved dividend yield. The political situation should remain stable with the next presidential election scheduled for 2024. However, macro risks remain high due to volatile commodity prices and the possibility of additional US/EU sanctions. AR Argentina 0.5 Argentina’s EMBI spread remained elevated, signaling investor concerns about the sustainability of sovereign debt. The country is expected to remain in a protracted relationship with the IMF, with which a renegotiation of the stand-by arrangement looks unavoidable as stipulation for a 2021 repayment looks difficult to achieve. Markets view the Macri government as the most suitable in this situation, although any future president will have very little latitude to deviate from current policies. BR Brazil 1 The new government’s emphasis on implementing ambitious economic reforms could provide a basis for higher economic growth and a better business environment for companies. MX Mexico 0.5 We expect the volatility in financial markets to continue as uncertainty about how the new Mexican administration will run the country continues. Unfortunately, we have heard a contradictory message in calls attended with members of the government’s political coalition. We cannot understate the challenges that the president may have in coordinating such a wide spectrum of ideologies. PR Peru 1 While President Martin Vizcarra’s approval ratings have declined, they continue to consolidate at relatively high levels for Peruvian standards as he seems to understand the demands of a population tired of the political establishment and corruption. However, Fujimorism seems to have lost appeal with the masses. We expect political noise, but believe that it should not deviate Peru from its sustained long-term growth trend. KW Kuwait 0.5 FTSE upgrade and potential MSCI upgrade to EM status could be positive catalysts for the market. Kuwait’s fiscal position appears stronger than its regional peers and hence more defensive. A persistent risk is political deadlock, which often leads to slower fiscal reforms and investments. SA Saudi Arabia 0.5 FTSE and MSCI EM upgrades could be strong catalysts for the market. The country continues to have stable economic growth, while the National Transformation Plan and Vision 2030 is being redrafted to reflect more realistic targets. AE United Arab Emirates 0.5 Within the region, the UAE is least dependent on oil revenues. Fiscal reforms such as the value-added tax (VAT) implementation have been successful. The strong property sector, however, needs to be monitored closely. EG Egypt 0.5 Egypt has made a committed step toward economic reforms. It is witnessing receding inflation and a strengthening currency. KE Kenya 0.5 The IMF expects around 6% GDP growth for 2019, but credit remains constrained and the IMF facility review remains undecided. NG Nigeria 1 The market is improving from a macro perspective with higher oil production and price, steadying inflation and foreign exchange liquidity. However, concerns remain about investment into Nigeria given the substantial claims against telecom company MTN and several oil companies, which have raised concerns surrounding the transparency around regulations. ZA South Africa 0.5 The outlook remains muted, although signs of improvement were evident with expectations of a better 2019. While still weighed by a slow recovery, and weaker global backdrop and sentiment, domestically, the country should be past the lowest point. QA Qatar 0.5 Risks include slowing economic growth, political conflict and deadlock, and continued weak investor appetite. The graphic above reflects the views of Franklin Templeton Emerging Markets Equity regarding each region. All viewpoints reflect solely the views and opinions of Franklin Templeton Emerging Markets Equity. Not representative of an actual account or portfolio. GDP growth estimates based on IMF data, as of April 2019. Data from third-party sources may have been used in the preparation of this material and Franklin Templeton (“FT”) has not independently verified, validated or audited such data. FT accepts no liability whatsoever for any loss arising from use of this information, and reliance upon the comments, opinions and analyses in the material is at the sole discretion of the user. Products, services and information may not be available in all jurisdictions and are offered by FT affiliates and/or their distributors as local laws and regulations permit. Please consult your own professional adviser for further information on availability of products and services in your jurisdiction. 1. Source: International Monetary Fund, World Economic Outlook Update, January 2019. There is no assurance that any estimate, forecast or projection will be realized.